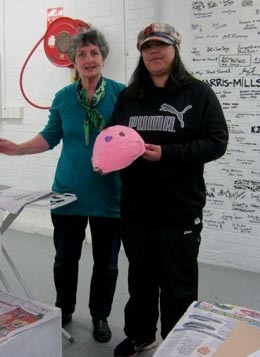 The Whanganui Creative Space, an art space for people in the community, is big on promoting inclusion where people from all walks of life are welcome. 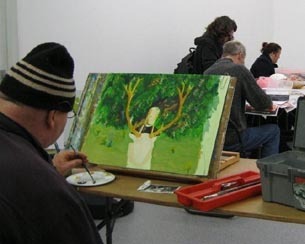 Corrie’s brother set up Atelier Artistiek in the Netherlands in 2005, an art space catering for people with physical and intellectual disabilities. She decided to follow his lead. When she discovered that Whanganui Creative Space had already been set up, she asked to join. “Our vision is to have an integrated community fostering and celebrating the creativity and contribution of all people,” says Corrie, mother to an 18-year-old man with cerebral palsy. In mid 2010 the trust organised some workshops in order to gauge the need for this kind of service in Whanganui and gain support for funding purposes. The workshops were run as art sessions offering a range of media, tutored by art professionals, and marketed to the disability and mental health sector in Whanganui. There were 75 participants in total. The feedback demonstrated a gap in the community for access to barrier-free arts and crafts activities. In between the trust’s inception in 2004 and the workshops in 2010, trust members had to develop a strategic business plan, agree on the “what and how”, find the right venue, and apply for funding. 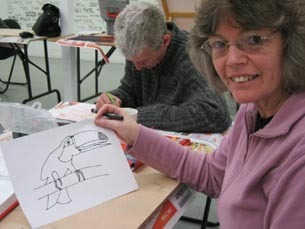 Fine arts tutor June MacKay runs the sessions and has volunteers to help her. She teaches a wide variety of art-making techniques, including mask making, painting with watercolour, papier mâché, clay work, flax weaving and mosaics. Attendance at the workshop sessions averages between 10 and 20 participants, who come from a wide range of services, as well as from the general public. “We are somewhat restricted in what we can provide, and have to be creative and resourceful. We rely on donations of materials like clay, mosaic pieces, paints and brushes,” Corrie explains. The trust would like to have a touch-screen computer for people who cannot hold a brush. Corrie and Lucy agree that they have achieved a lot. “We are financially, physically and attitudinally barrier-free,” Corrie says proudly. Lucy says that participants and their caregivers report increased confidence, enjoyment, motivation and concentration. They learn coping and social skills for life. Original generation time 1.3796 seconds. Cache Loaded in: 0.0005 seconds.